Hi everyone! 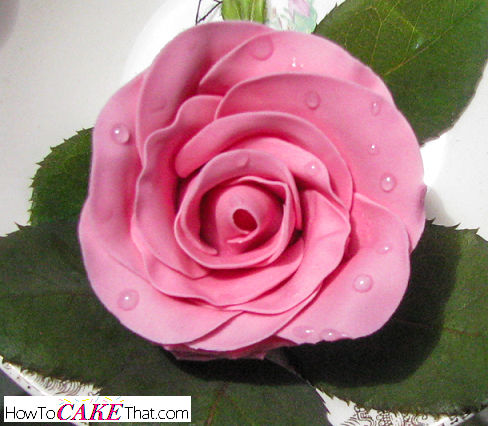 I just discovered a super easy way to add realistic dew or rain water droplets to your gum paste flowers or other fondant decorations! It's a single ingredient... and best part: no heating required. Just decorate and let dry! I was searching through my cake cabinet and came across a bottle of corn syrup, and I noticed there was a single drop that must have dripped down the side from the last time I used it. And what I noticed about this drop was that it was completely dry, but yet it still looked wet! 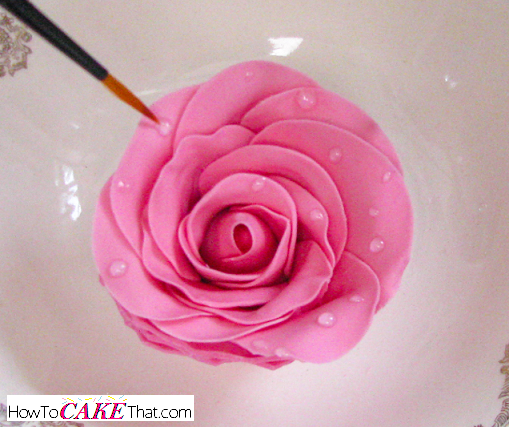 And I thought, "oh, this would be perfect for adding water droplets onto my gum paste roses"! So, I tried it. And it worked super well! All you need to do is load up a fine tip paint brush with a good amount of corn syrup, and lightly dab little dots directly onto the petals or leaves of your dried decoration! Keep the droplets very small to keep them looking realistic, and also to keep them from running... unless that is the look you are going for. And then allow your decoration to sit still, untouched until the droplets dry completely. This could take up to several days depending on the size of your droplets and the humidity level in the air. How easy is that? !